Running is one of the best ways to explore a city. Perhaps that’s why more and more people are traveling each year to participate in a marathon, half marathon, or other destination race. Chattanooga has become a big part of this trend, attracting runners to two major marathons, an IRONMAN Triathlon and dozens of smaller races. With more than 50 trailheads within 30 minutes of downtown, Chattanooga has also become a trail running mecca, with runners flocking to the area both to race and enjoy the some of the most scenic trails in the Southeast. Ready to run around Chattanooga? Here are just some of the options for planning a running-based trip to the Scenic City. Each October, the Seven Bridges Marathon, Half Marathon and 5K invites runners to cross the Tennessee River six times while exploring downtown Chattanooga, including running past the Tennessee Aquarium, AT&T Field, the Creative Discovery Museum and, of course, a trip on the historic Walnut Street Bridge. The race begins in Coolidge Park and will also give runners an up-close look at several riverfront neighborhoods. In March, the Erlanger Chattanooga Marathon and Half Marathon follows a beautiful course travels from the Tennessee River to the base of Lookout Mountain, also through Chattanooga’s downtown district. A marathon not enough for you? 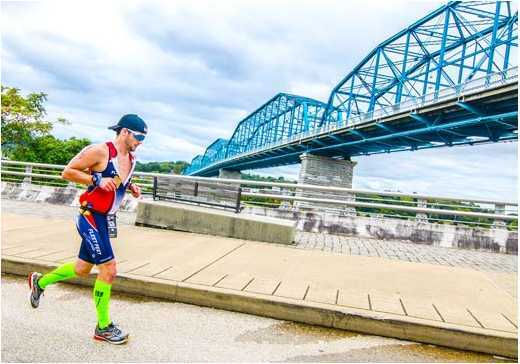 Each September, the triathlon world comes to Tennessee for IRONMAN Chattanooga, which features a 2.4-mile swim, 112-mile bike and 26.2-mile run. Sound a bit much? The IRONMAN 70.3 Chattanooga held in May features half of those distances. The Raccoon Mountain Marathon/Half Marathon in March is an interesting hybrid that includes both road running and trail running. The race begins at Laurel Point at the top of Raccoon Mountain and includes some challenging climbing in addition to spectacular views of the city. A relay race is also available for those more team-player minded. The Chattanooga Track Club is a nonprofit organization with the mission of promoting running and fitness for all ages. Some of its popular annual running events include the Chickamauga Chase—a 15K, 5K and trail race that will be run for the 49th time in April 2017. 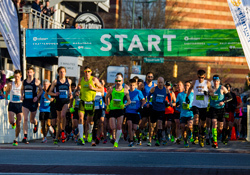 Other CTC events include the Market Street Mile, the Missionary Ridge Road Race and the Chickamauga Battlefield Marathon/Half Marathon, held in November. In May, the CTC will hold the 50th annual Chattanooga Chase 8K and 1 mile—the oldest active competitive road race in the area—featuring a tour of several scenic North Shore neighborhoods. Wild Trails is another nonprofit promoting trail running and other forms of outdoor recreation. The Wild Trails race series is one of the Southeast’s premier points-based trail running experiences and each year you’ll find a number of different trail races with varying mileages. Some of the more popular races include the Nature Calls 15K and 5K, the Lookout Mountain 50 Miler and the Thunder Rock 100 Miler. In November, Wild Trails will host the 9th annual Upchuck 50K, which, as you may have guessed, is not for the faint at heart. The point-to-point trail run on the technically challenging singletrack of the Cumberland Trail features many climbs and descents into Soddy Creek, Possum Creek and Rock Creek. 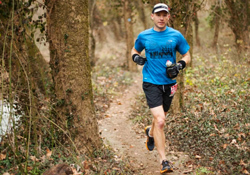 Retailer Rock/Creek has been an avid proponent of trail running in the Chattanooga area and established some of the region’s first competitive trail races. The Rock/Creek Trail Series is meant to encourage, introduce and challenge all runners to experience the incredible trails and natural wonders that Chattanooga has to offer. The series also benefits non-profit organizations committed to the preservation, maintenance and protection of the land within the areas where the races are located. One of its most popular races, Rock/Creek StumpJump 50K/15K, is coming on October 1. 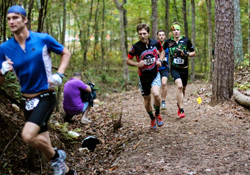 This is one of the premier 50K trail races in the Southeast and takes place on Signal Mountain and Walden Ridge with more than 6,000 feet of elevation gain. Runners will enjoy beautiful views of the Tennessee River Gorge and some of the most beautiful scenery along the Cumberland Plateau. Whether you prefer a rugged trail race or an urban tour on pavement, you have plenty of choices when it comes to running in Chattanooga.